Google Lat Long: How do you geo? Share your story! How do you geo? Share your story! It's always fun to hear about the creative things people are doing with our geo tools. Recently, we heard about a local landscape architecture and planning firm using Google Earth to save themselves plenty of time and money. The team was able to create an exact sculpture of 1200 square miles of scenic wild lands without needing to visit the site. 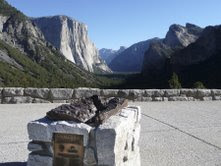 Cara Ruppert, a landscape architect at Royston Hanamoto Alley and Abey (RHAA), took on that task when she started the Yosemite Tunnel View Overlook Rehabilitation project. She set out to design an expanded viewing platform featuring a bronze three-dimensional topographic model of the Yosemite Valley. Her goal was to bring visitors closer to one of the most breathtaking, majestic views of Yosemite Valley. From her desk in Mill Valley, California, she used Google Earth to plan and design the viewing platform, as well as create an accurate cut out of the valley's terrain that depicts the peaks, sharp mountain ridges, watersheds and dimensions of the land. The RHAA team was able to view satellite and 3D imagery of the terrain to help build a mold of the valley. Once the Google Earth image was reflected in a mold of the site, the team was then able to create the bronze sculpture for all visitors to enjoy. Of course, this is just one of the ways people are putting our geo tools to use. If you have a story about we'd love to hear it -- fill out this form and let us know!